A needle used to shoot up in Lowell. 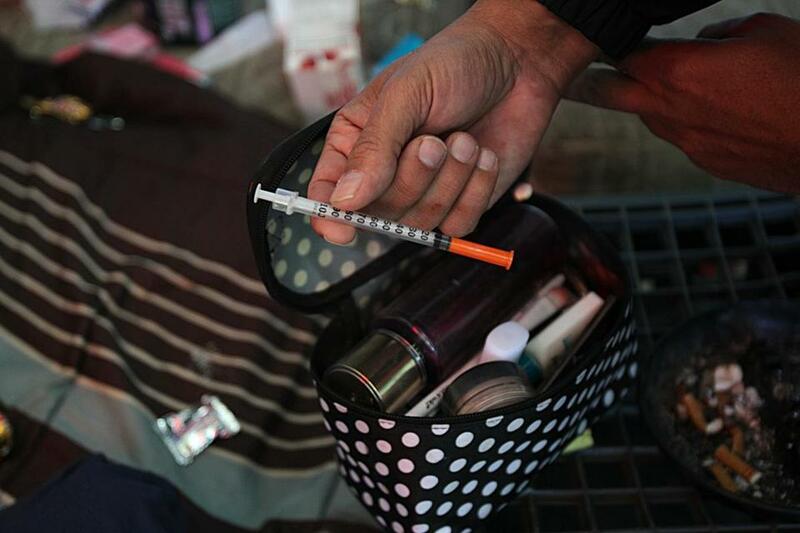 The outbreak of HIV among injecting-drug users in Lawrence and Lowell has spread to many more people than originally thought, resulting from the early arrival of fentanyl in northeastern Massachusetts and other factors, a federal inquiry has concluded. Federal disease-trackers counted 129 new cases of HIV among injecting-drug users in the area since the beginning of 2015 — 33 percent more than state officials’ original count last spring. Homelessness and incarceration played an important role in the spread of the virus, by limiting access to treatment that suppresses it, according to the eight-page report released Wednesday. Other factors were a decline in HIV testing and in the practice of tracking down sexual or drug-sharing partners of infected people. The 129-case count is “a very large outbreak of these infections in this population,” said Kevin Cranston, director of the state health department’s Bureau of Infectious Disease and Laboratory Sciences. “Now we really understand the scope of this problem,” Cranston said, noting that for many years there had been little transmission of the virus among drug users in Massachusetts. The spike in HIV cases was first noticed in Lawrence in 2016, a sign that overdoses are not the only deadly consequence of the opioid epidemic. As the HIV numbers continued to increase and a similar cluster was detected in Lowell, the Massachusetts Department of Public Health called in specialists from the US Centers for Disease Control and Prevention last spring. Some 19 CDC staffers came to the state in rotation over a five-week period that ended June 1. Deploying sophisticated molecular techniques, along with on-the-ground interviews in the affected cities, the CDC was able to clarify the extent of the outbreak. Fentanyl, a powerful synthetic opioid, started entering the illicit drug supply earlier in the northeastern part of the state, and the concomitant increase in overdose deaths also spiked sooner there, as well. In the CDC report, Lawrence was described as a “longstanding drug distribution hub” and “now a production hub for illicit fentanyl” where the drug is significantly cheaper. “What’s different about this part of the state is the timing of the introduction of fentanyl that helped trigger the outbreak,” Cranston said. Because fentanyl produces a shorter-lived high, users tend to inject more frequently, increasing the likelihood of infection. Asked whether he was worried about a similar outbreak elsewhere in the state, Cranston said state officials have long been concerned about HIV spreading in this population, as has already happened with hepatitis C.
Now, however, the CDC’s experts have provided the software and training that will enable state health officials to quickly identify any future clusters or outbreaks. The state has also been boosting prevention efforts by expanding its network of syringe exchanges, with 20 now in operation, including one that opened in Lawrence a few months after the outbreak was detected. Five additional cities, including Lowell, as well as the towns on Martha’s Vineyard, have recently approved opening such programs, which provide clean needles and other services to people with addiction. The state will also work to encourage health-care providers, including hospital emergency rooms, to test for HIV more frequently, Cranston said. “Our job right now is to stay vigilant and to support those programs helping people prevent infection,” he said. Dr. Christopher Bositis, who heads the HIV program at the Greater Lawrence Family Health Center, said the findings do not identify anything unique about Lowell and Lawrence, but rather point to well-known societal failings. In addition to the problems with fentanyl and homelessness, he mentioned limited access to effective treatment for addiction, especially in prisons and jails. “This certainly could happen in other places,” Bositis said. “This is a significant problem that was created by multiple complex structural and societal issues, so don’t think there’s going to be a simple answer.